This page is deprecated and content will slowly disappear as it is moved to appropriate pages on the site. No more items are likely to be added here. 2015-05-17 — today I saw a keyboard labelled "Ortek MCK-701W/702W", FCC ID KJXMCK-701W. It was a rubber dome keyboard that was externally identical to the reverse-curve Acer 6511 with the sheet metal back and paired legs, but had a standard Ortek label. All Google turns up is one set of photos showing a Reckon-branded keyboard (MCK-702W I suppose) with a bowed space bar (and I honestly don’t recall if the Ortek had this or not) and no photo of the back to demonstrate the Acer design, only a photo of an unbranded Ortek label. This is not the first time that an Ortek keyboard has appeared with a Wentek FCC ID (grantee KJX) but the first that I have seen of either Acer/Ortek collaboration or Ortek copying Acer. Wentek is probably part of or otherwise related to Ortek though. The CVT Avant Stellar keyboard has an LED inside the up arrow key. As this was another modern keyboard with simplified Alps switches (SKBM White) I was curious to find out what CVT were using for the LED switches. 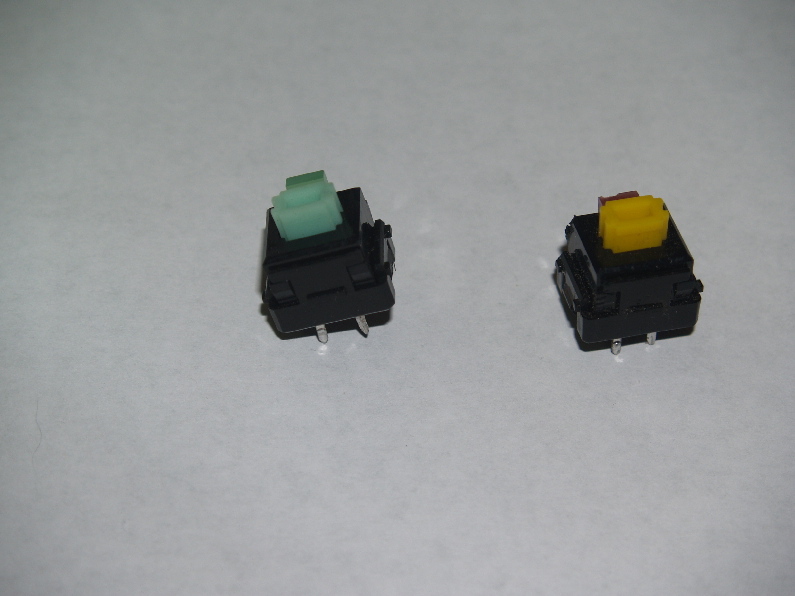 According to Bob, the switch with a yellow slider is the original type found in keyboards, and the switch with a green slider is a replacement from a CVT distributor. The critical identification details aren’t visible or shown in the photographs, but a yellow slider matches Himake/Hua-Jie catalogue specifications. 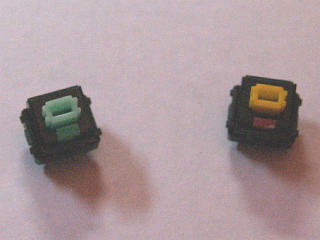 Additionally, Xiang Min have never been known to use yellow sliders, but they use green sliders extensively, so the replacement switches are likely to be Xiang Min. I have yet to obtain any photographs of these switches in a keyboard (alongside the simplified Alps switches used for the other keys) so for now I’m placing this information here as a reference. 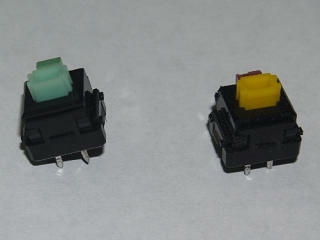 The suggestion however is that Alps SKBL series never included an LED switch. The only known SKBL datasheet shows a switch without the characteristic LED slot (a switch thus far not seen in a keyboard), so it appears that either Forward or Alps no longer considered this feature to be necessary. Keyboard manufacturers disagreed, and therefore had to obtain this type of switch from other switch manufacturers. The presence of “Sung Wei” on Datacomp keyboard PCBs has intrigued me for a while. Previous attempts to find out what the term means failed. However, after seeing the same term on the PCB of a Monterey K102 keyboard, I had another dig. The answer would appear to be that Shenzhen Sung Wei Electronic Co. Ltd was the PCB manufacturer, as that is their speciality. Geekhack — FK-9000 not working - any ideas? The slider is white (well, colourless), as described by the Himake catalogue. The keyboard shown here on Imgur (with what are assumed to be Mitsumi KCT or KCM switches) has rather curious keycaps, with very steep sides. The double-shot moulding and internal structure is identical to SMK’s later keycaps, as seen in a SMK-made Tulip keyboards. The same steep-sided design was however used by a confirmed Mitsumi keyboard. That keyboard has very different keycaps, with eight-way diagonal bracing and surface-ink legends. Sadly, despite having a Mitsumi PCB, there is no model number present, so we cannot determine the switch type or gain any further switch type confirmation. It, too, seems to be KCT or KCM series, but with the standard design instead of the unusual design found in the K7S. 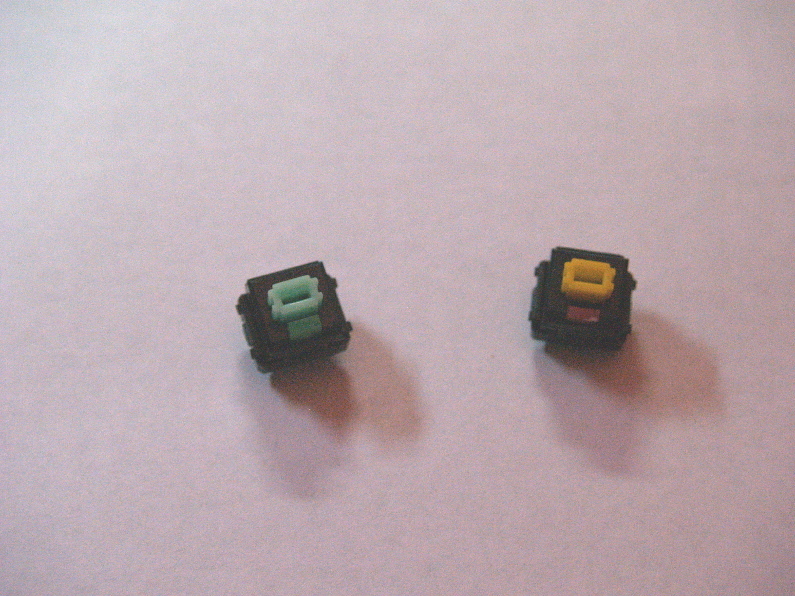 Although the switches in the K7S cannot be proved to be real Mitsumi (as no switches were ever inspected by the keyboard’s owner), it is interesting that the unusual keycap shape matches that of a confirmed Mitsumi keyboard.